Pinterest has acquired Icebergs, a “Pinterest for creative types,” which offered an online collaboration service that allowed users to organize their projects, including not only images, but also articles, files, videos, and other content, and share that content with others. The Barcelona-based company was founded last year, and had a team of just over a half-dozen in both Barcelona and London. The two co-founders, César Isern and Albert Pereta will be joining Pinterest and relocating from Spain to San Francisco, Pinterest tells us, where they will join the company’s product management and product design teams. Terms of the deal were not disclosed, but the move sounds like it was more of a talent acquisition, as the Icebergs online service is soon to be shut down. Users will have until September 1 to export their projects and files, and the company promises there will be a variety of ways to extract that data before the service goes dark. “The technology will not be integrated with Pinterest; however César and Albert’s experience in building systems for the discovery and organization of objects will be incredibly relevant as they help build out Pinterest,” a Pinterest spokesperson explains. 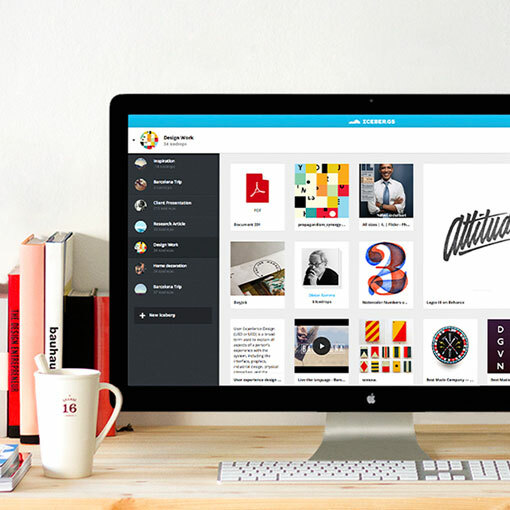 The service, though somewhat competitive with Pinterest in terms of being another resource for visual inspiration, appealed to designers and other creatives, as it allowed for easy image upload and support for more file types, the ability to add notes about projects in progress, and tools to share, download, comment on or delete the files stored in its cloud. More importantly, it functioned as a private workspace versus Pinterest’s, by default, more public boards. Pinterest has acquired a number of smaller companies in recent months, including also image recognition and visual search startup VisualGraph, recipe discovery site Punchfork, recommendations startup Livestar, and code challenge site Hackermeter. Most of the companies it buys are smaller-stage, as is Icebergs, which, according to Crunchbase, had not raised outside funding. Today we want to share some incredible news with you. We’re thrilled to announce that Icebergs has been acquired by Pinterest! Over a year ago, we set out to create a private space in the cloud for you to save, organize and collaborate around your projects like never before. We built Icebergs aiming to design a new and better experience on content organization. We’ve gathered an amazing community along the way. We took care of every single detail and put our souls into it, but it was hundreds of thousands of creative minds around the world who trusted us and helped us grow beyond our expectations. We are thrilled to be joining forces with the talented Pinterest team in San Francisco. Pinterest is a visual discovery tool people use to discover, save, and act upon the things they love, which makes it a perfect home for our experience in product and design, and in building Icebergs. On Pinterest, there are tens of millions of people using the site to discover more than 30 billion Pins every day, and we can’t wait to use what we learned building Icebergs to help make their experience even better. Sadly, Icebergs will be discontinued on September 1, 2014 — Together with its mobile app and services. But don’t worry, as of today, we offer all our users a few options to export their content until the day of closing. A million thanks to all our Penguins, friends, family and the incredible Icebergs team for sharing with us this adventure. We look forward to meeting again. Stay cool!